Home / Healthy Eating / Healthy eating: What you need to know! 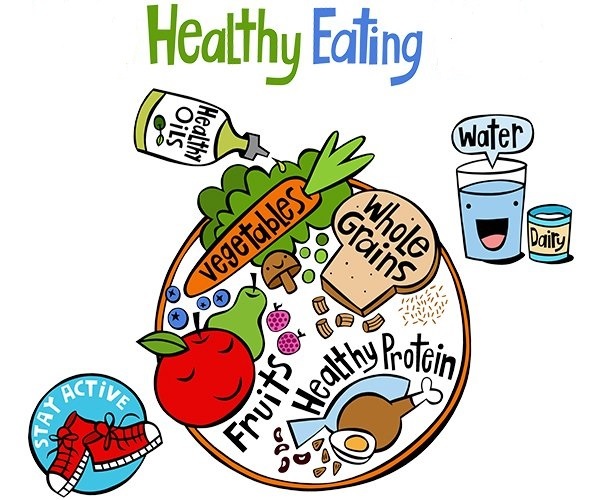 Healthy eating: What you need to know! No single food contains everything that you need to stay healthy, so the golden rule is to eat a variety of foods each day. Eating healthily doesn’t mean cutting out foods that you enjoy, but simply eating some foods less often and/or in smaller portions, and eating more of other foods. All major supermarkets have agreed on a standard label that you’ll find on the front of food packaging to help you make healthy choices. Keeping to a healthy weight is important. It’s not good for us to be either overweight or underweight. If you’re concerned about your weight in any way, make an appointment to speak to your GP. Research suggests that people who eat plenty of fruit and vegetables are less likely to develop heart disease, certain cancers, and eye conditions. To help you reach the target of five a day, think of all the fresh, frozen, canned or dried fruits, fruit juices, and vegetables that you like. Try to choose five different-colored ones to have with or between meals. You should aim to have one portion of white fish, such as haddock or cod, and another of oily fish, such as salmon, mackerel or sardines. Oily fish are rich in vitamin D and a type of fat that helps prevent heart disease. But grill, poach or bake fish rather than frying it. Many of us eat too much salt, which can increase our risk of high blood pressure and stroke. Always think before you sprinkle salt on your meal. Compare food labels and look for lower salt versions of foods such as processed meats, savory snacks, biscuits, cheese, bacon, soups and ready meals – much of the salt that we eat is already in food when we buy it. If you’re choosing between two similar products, food labels can help you quickly find a healthier choice. This includes foods such as cakes, biscuits, sausages, meat pies, fatty meat, and cheese. 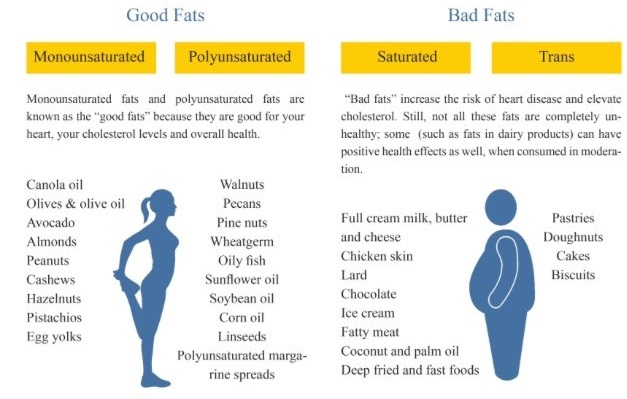 Saturated fats raise the level of cholesterol in the blood and increase the risk of heart disease and stroke. This does not have to be water. Tea, coffee, fruit juice or squash will do. It’s particularly important to drink plenty in hot weather. Do I need bran to prevent constipation? Bran should only be used as a last resort. First, make sure that you have enough wholegrain cereals and fruit in your diet. Drinking plenty of liquids can help, too. Physical activity helps to keep the bowels moving, so try to think of ways to stay active. In order to enjoy your food, it’s important that you keep your teeth and gums in good condition and if you wear dentures make sure they fit comfortably. You can keep your teeth and gums healthy by brushing them twice a day with fluoride toothpaste and by visiting your dentist regularly for a checkup. Even if you have full dentures, a regular check-up is still important. The shape of your mouth changes over time, so you are likely to need new dentures every five years.